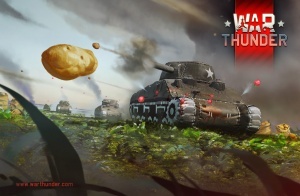 Every year on the 1st April since 2013, War Thunder has held special one time only events. From Giant Japanese Snails and Flying Ponys to Russian Mechs and Inflatable tanks, players could be faced with absolutely anything on this day! April Fool's Day is a day full of jokes, hoaxes, and other cruel teases that plays at the victim's willing to believe. Gaijin Entertainment decided to join that bandwagon of mischievous in 2013. Their events are introduced as an authentic and permanent addition of the game, with varying details to back up their statements such as elaborate pre-constructed tech trees or releasing events that conform to previously confirmed information. The reveal that the event is an April Fool's Event is either announced the next day or called out by sceptical people who are aware of what time of the year it is. Gaijin Entertainment keeps the events around for at least a week before removing it from the game. A concept art drawn up for the Unrealistic Battles event.